Children of today’s world need different ways of parenting. Have you ever thought about how different you are now, to the person that you were five or ten years ago? Do you sometimes think back wondering, why on earth did I do that? Or say, if only I knew then, what I know now, I would’ve done things so differently!? That’s life, isn’t it? The more aware you become, the easier it is to do things differently, and the more things change around you, the more you have to change. Parenting is the same – constantly changing and developing over time. With more awareness, you can parent differently. This book is a manual for today’s positive parenting – teaching you to understand and relate differently to your child. Think of it like this: if today’s children are like ‘iPods’, we are like record players. Both systems play music, yet the instructions are completely different! Parenting the way you were raised, is like trying to use the instructions for a record player to operate an iPod! It just won’t work. They are totally different systems. Your child (iPod) is already different to how you were as a child (record player). Born into a digital world, generations of children are growing up with constantly advancing technology at their fingertips. With so much choice in education, entertainment, clothing, food and sport, at the click of a finger children can find out anything! They’re living in a completely different world to the one you grew up in, where development, technology and society’s whole way of operating has radically changed the way we live. Children are also more creative, conscious and connected nowadays. Aware of everything that’s happening within and around them, they often think differently, ask fascinating questions, or demand explanations for why things must be done in certain ways. Sometimes they even point out brilliant new ways to solve problems, which we adults, just don’t see! Today’s generation are connected to each other and the world in a whole new way. Maybe you’ve noticed that harsh threats, loud demands, shouting and any kind of emotional manipulation backfires with them? You’ve probably also realized that the punishment that worked on us as kids, just makes matters worse with them! Being told what to do “because I’m the parent and I say so” is often not enough. “You’ll make mommy cry” is sometimes laughed at, or ignored. Do you find that he’s strong-willed and knows what he wants, demanding your full attention and respect? Yet alongside this, you might’ve become aware of how sensitive children are to feelings (theirs and others) and criticism. And how about his strong sense of fairness and compassion, and his seemingly endless energy? With all of the differences and challenges of today’s generation, it’s normal for you to feel confused, helpless, exhausted or overwhelmed. Wanting better ways to relate to him, that actually build his self-esteem? Then this book is for you. It’s written to help you raise your kids positively. The book’s framework is divided into three critical keys which you need, in order to parent differently. They are: a secure foundation, respectfully-involved parenting and feelings. Each is equally important in today’s positive parenting approach. Like the legs of a tripod, if any leg is shorter (i.e. that area is not given enough attention), the tripod (child) will wobble and create an imbalanced view. Learning to create a solid foundation, as the necessary base from which to build your child’s self-esteem, and understanding how being emotionally secure affects many important areas of your children’s life is where we start. Then you’re ready to build your children’s self-esteem – remember the unintentional things that damage their developing self-esteem and discover a practical framework for easy self-esteem building. The third chapter deals with how big changes affect kids; how we can help them cope well with beginnings and endings; and important tools for dealing with separation and divorce. In chapter four, we learn how to help child facing big storms” that life sometimes throws at them (i.e. bullying, death of a loved one or trauma). Whenever kids feel valued and respected everything is better. This section explains how and why parenting styles have changed so radically; the core qualities to develop in positive parenting; why respectfully-involved disciplining works best; how to get closer to your kids and win their co-operation; and how to discipline in ways that teach responsibility and develop their self-esteem. We learn why nowadays disciplining is less about a “method” and more about how you speak and your relationship with your child. In the final section, I explain why feelings are so important for children, seeming more “real” than their thoughts, yet they can’t easily express their feelings in words and show us their feelings show in behaviour instead. We learn that our job as parents is to purposefully help our children fully recognise and let go of their feelings, so that their behaviour can change naturally. In chapter nine we learn how feelings and needs drive our children’s behaviour, and what they’re need when they misbehave. We look at how when something troubling happens, a build-up of unexpressed feelings and needs will surface as a change in behaviour, which children can’t easily understand or change without our help. 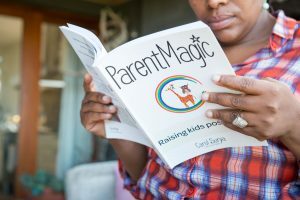 The book ends with easy tools for to help kids deal with their feelings and high energy levels, as well as learning practical recipes of speaking and disciplining, which work like magic for today’s kids.